From time to time, the MXR design team likes to invite guest designers to collaborate on pedals. It’s one of many things we do to keep a fresh and forward-thinking perspective, serving MXR’s ultimate mission to provide players with innovative, practical stompboxes that will stand up to the rigors of the road. In 2014, we worked with Italian pedal designer Carlo Sorasio to create the Il Torino™ Overdrive, and in 2015, we worked with Fuzzrocious Pedals’ Ryan Ratajski to create the MXR Bass Distortion. 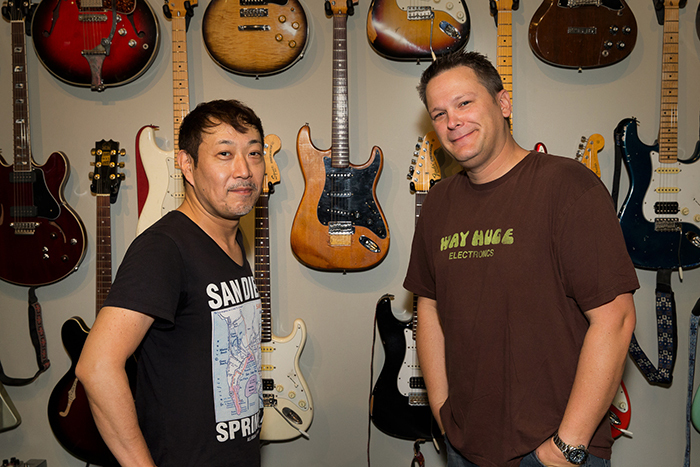 This year, we worked with Shin Suzuki, Japan’s most celebrated pedal designer and the owner of Shin’s Music, where he also builds custom amps and guitars for artists. He leant us his intimate knowledge of a legendary boutique amp to create the Shin-Juku™ Drive, a pedal that provides smooth, wide open overdrive with tons of sustain and incredibly fast response time to every playing detail. The Shin-Juku Drive’s simple three-knob interface allows you to call up a wide range of sounds, from an organic boost to full on grinding overdrive, with a Dark switch to cut high frequencies for a darker, mellower sound. During a recent visit to the US, Shin sat down to tell us a bit about himself and the Shin-Juku Drive. How did you get into the pedal-making business? I first became interested in building pedals when I was in middle school. By the time I was in high school, I was already building pedals for my musician friends. Basically, I taught myself how to repair and modify equipment as well as build new equipment from scratch, and one day I decided to do it for a living. Today, many Japanese artists and even some famous American artists use equipment that I have made or modified in some way. What was your goal when you designing this pedal? I wanted to create a pedal that would match the big, wide open sound, the smooth overdrive, and the fast response of a particularly mythical style of boutique amplifier. I know the style very intimately because I have not only played and listened to them, but also repaired them. I think that the resulting pedal, the Shin-Juku Drive, really nails it. Not only the sound, but also the feel and response to your attack. It’s not simply an overdrive—it’s like an amp in a pedal box. At certain settings, the Shin-Juku Drive is perfect to use as an “always-on” effect to put the finishing touch on the tone coming straight out of your guitar. How were you able to achieve that sound? Well, I knew exactly what sound I wanted, and as I said, I am well-acquainted with the inner-workings of the amp that produces that sound. I had a good idea of where to start the design process. I chose a bunch of different parts that I thought would get me close to the sound of that legendary amplifier, and then I made a pedal. I tested the pedal again and again, changing parts as necessary, until I matched the sound I wanted. This is the same process I go through for most of the pedals I design. What does the Dark switch do, and why did you include it as a feature? I included the Dark switch to give players the option of a slightly warmer sound. Pushing the switch cuts some of the high end, which is perfect for taming the brightness of silverface or blackface-style amps, or for when you just want a smoother, mellower sound.